Hammocks. . Wallpaper and background images in the A Series of Unfortunate Events club tagged: a series of unfortunate events violet bauldelaire klaus lemony snicket sunny. 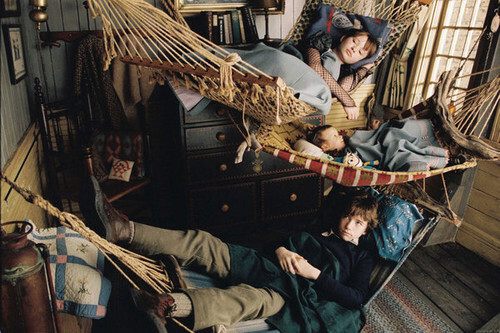 I STILL think that Klaus looks uncomfortable in that hammock. To me, Violet looks so comfortable, she's about to fall out of her hammock. Sunny looks comfortable, but not as comfortable as Violet. Klaus, well, he just looks REALLY uncomfortable, that's all I can really say! I just noticed that Sunny has a Littlest Elf doll in her hammock. Does anyone else find it weird how the Littlest Elf appears almost everywhere? OMG! I never saw that before! Thanks for pointing that out! Yeah, that is weird that the littlest elf shows up EVERYWHERE. Like in both Mr. Poe's car and Count Olaf's car is the ridiculous theme song for the Littlest Elf. I often wonder if when they both have free time in their hands, they go driving down the street scream-singing, "CHIT-CHATTERY CHIPMUNKS ALL SINGING ALONG!! HUMMING THEIR JOIN IN A SPRING-ALONG SONG!! SPRING IS THE SPRINGIEST TIME FOR A SONG, IT'S A LOVERLY, LOVERLY SPRING!!!!!" LOL!!!!! IKR? I would LOVE to see Olaf & Mr. Poe doing that!!!! Imagine if the Baudelaires saw that! It'd be something like, "Violet, why are Mr. Poe and Count Olaf scream-singing?"